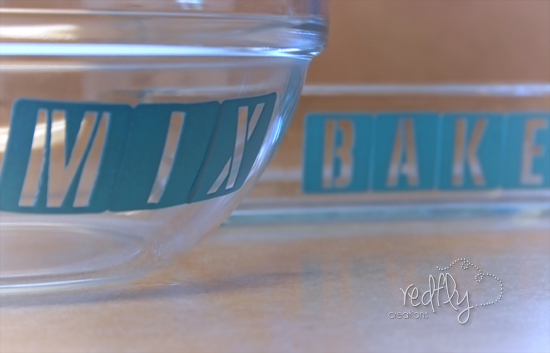 Redfly Creations: Customize a Gift with DIY Glass Etching! 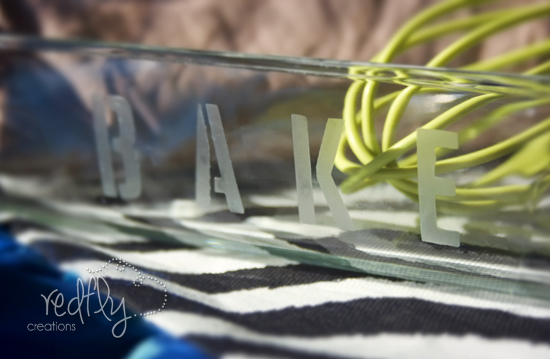 Customize a Gift with DIY Glass Etching! My 11-year-old daughter is rediscovering a love to bake. She really misses her little easy bake oven that was sold at a garage sale last year. I am so glad it sold because my daughter has outgrown cooking with a lightbulb, plus the baking mixes tasted horrible! Well, don't tell her, but for Christmas this year she is getting an entire baking set including a custom apron, baking mixes, and a set of little dishes to bake to her heart's content. 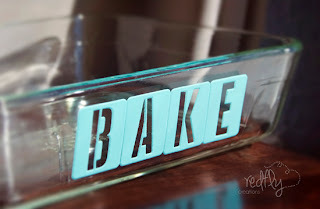 Since I made the apron and mixes myself (more on these in future posts), I needed a way to add a personal touch to the bakeware. 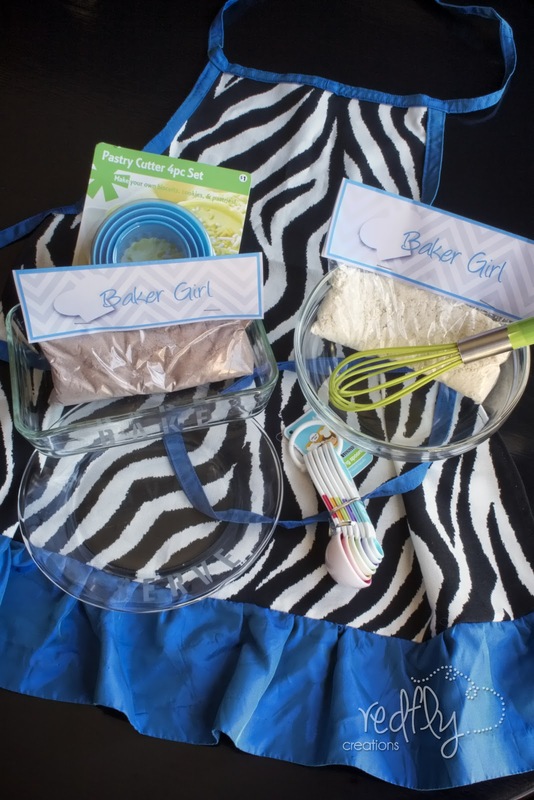 I was looking for that extra pop to make these ordinary dishes into a fabulous gift that my daughter would love. 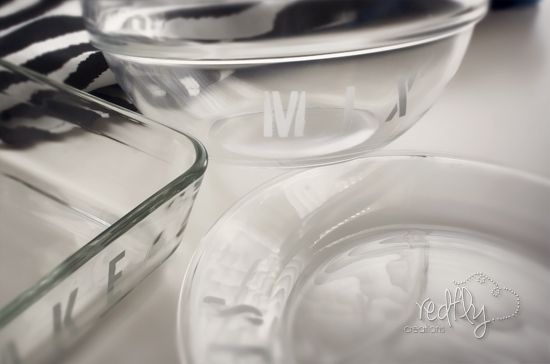 As it turns out, Martha Stewart Paints had the simple yet perfect solution - glass etching! I have wanted to try glass etching for quite a while, but have always been a little intimidated to try it. It always seemed complicated and that it would require too much skill. Boy was I deceived... glass etching is sooo simple! 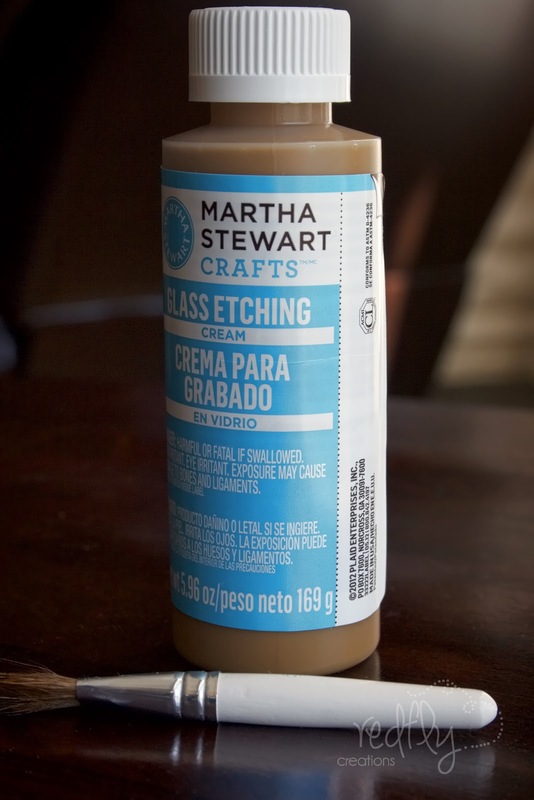 This is your main ingredient, the miracle worker, Martha Stewart Glass Etching Cream. I love it! The other two ingredients are a sturdy brush and a set of stencils. I used these peel-and-stick stencils which are also from Martha Stewart. At first I thought that I was only going to be able to use the stencil once, so I was planning accordingly. 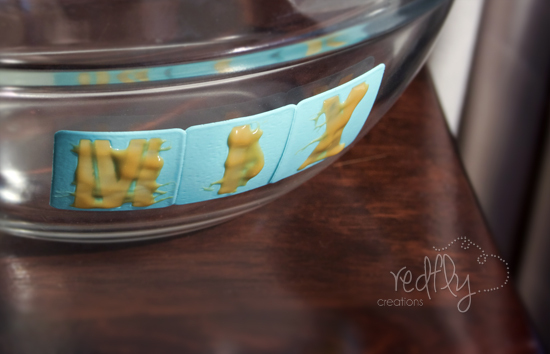 After placing a letter on crookedly, I quickly realized that the Martha peel-and-stick stencils are so sticky they can be used over and over again. Score! 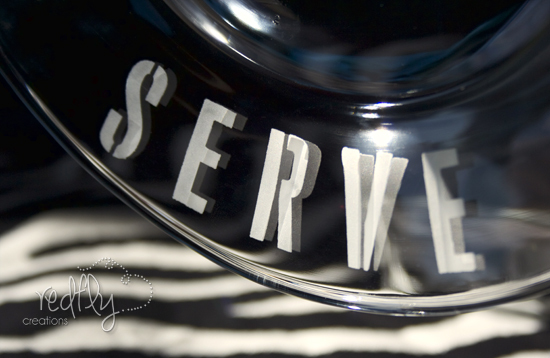 After fixing the stencils on the dish, it is recommended to place tape around the stencils in order to keep the cream from inadvertently spreading onto the rest of the glass. You do not want the cream to touch any other part of the glass or it too will be etched! Next, generously layer the cream on the stencil with a brush. Then let it sit to do its magic for 15 minutes. After the 15 minutes, wash the cream off with water. 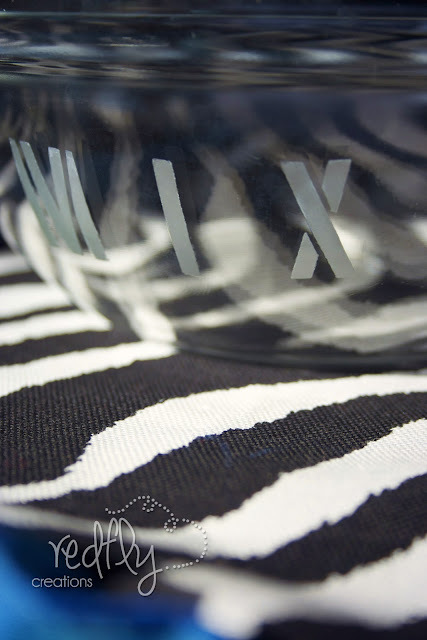 Peel-off the stencil and wa-la... a beautifully etched piece of glassware! The result is permanent and will endure washing and baking up to 350 degrees. There you have it! A simple way to etch glass. Thanks to Martha Stewart, my Christmas gift has the final custom touch. I think my daughter is going to like it. 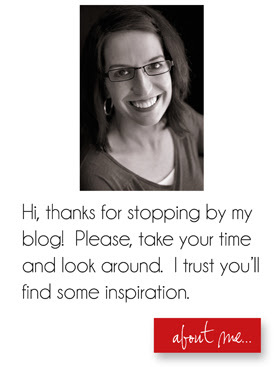 This tutorial is part of a paid campaign with Martha Stewart Paints and the Blueprint Social. The opinions in this post are my own. Beautiful and looks so easy! 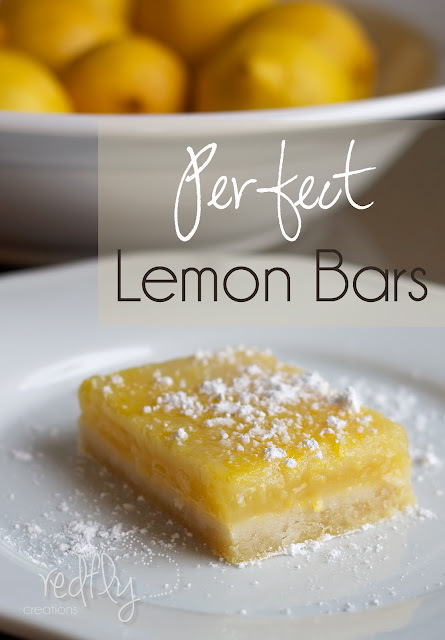 These are so simple yet so adorable! I just love the little words you added. Perfect! These are so fun! I have a daughter who loves to bake as well, what a fun Christmas present! Love these! I've got to try the etching! Great project, Melissa! 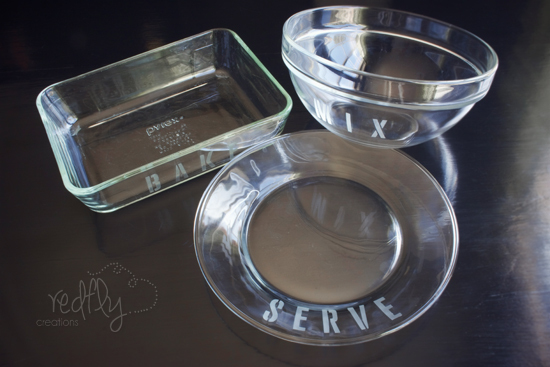 Perfect for hostess gifts for the holidays, or sprucing up my own serveware! Wonderful job! What a sweet gift! I can think of a few little bakers in my life that would totally adore this too! By the way, I wanted to let you know I am using your recipe for homemade laundry detergent, with one minor change: I added Purex Crystals to the mix! It really gives the detergent a nice fragrance, which I like. 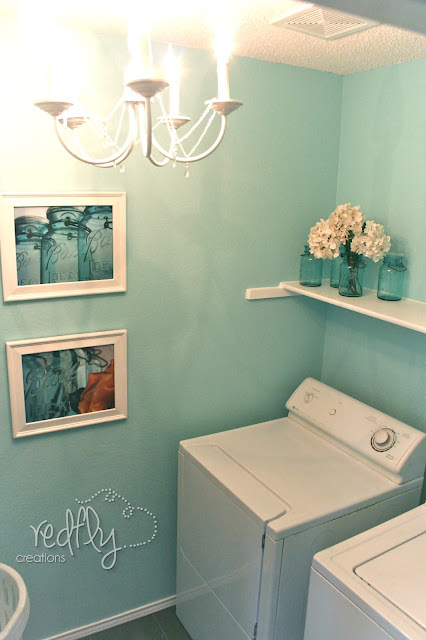 If you come up with a great homemade laundry stain pretreatment, please post!!!!! So glad you enjoyed this project Erin! A couple of other people have mentioned the Purex Crystals too. 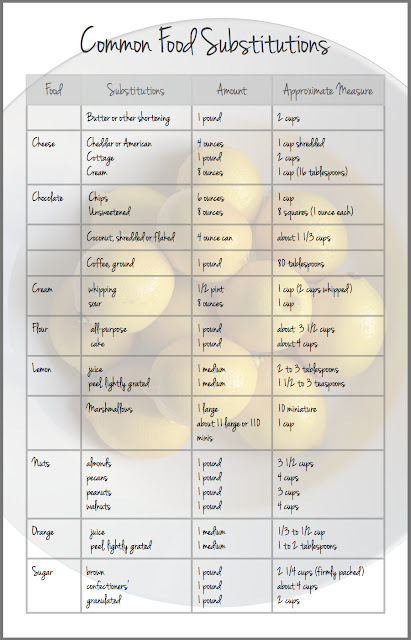 I think I am going to have to try those. I agree about the stain pretreatment. I'll keep my eyes peeled, and let you know if I find a good one. Thanks for being so encouraging!! I need to get my oldest daughter, 10 years old now, in the kitchen baking with me more. I love the customization look. I am transitioning my two oldest kids from plastic kids cups to our regular glass drinking cups. I am thinking of using glass etching so I can remember whose cup is whose since they are all the same. Thanks for the inspiration. That's a great idea Christa! How cute! This is such a great idea. Stopping by from Love & Laundry. One Day Glass.Com specialize in custom cut tempered glass, NeoCeram and PyroCeram (Heat resistant) glass.